In the interest of Science, A Bread A Day will be coming to you this week from The Mile-High City, Denver, Colorado. That’s right, this week we’ll be discussing high-altitude bread baking! This is very exciting for me (yes, seriously), since I’ve only ever baked around sea level or slightly above. Here’s a new baking challenge, one that can only come about by hopping on a plane and flying across the country! I love it! This week, I’ll be trading in my own kitchen – delightfully equipped to my personal specifications, where I know the precise location of every single utensil at any given moment, and where all the bread equipment is ready to go at a moment’s notice – for my incredibly game and tolerant sister’s kitchen – one that I’ve never even seen before, hasn’t been updated since the mid 1960’s, and where there may not even exist loaf pans. Note the lack of a window. Niiiiice. Yes, in the interest of Science, I have devised a system of experimentation. Having never baked at high altitudes before, I didn’t want to try new and untested recipes; but neither did I want to re-make old recipes, as the theme of this blog is to bake a new recipe every day. What I have decided upon is a series of two breads, one quick bread (chemically leavened) and one yeast bread. I’ll bake one of each in my Chicago-based home kitchen, as “control” loaves, then bake them exactly the same in Denver, at 5,280 feet above sea level. After this first high-altitude batch, I’ll contrast and compare with the control bread (which I’ll bring with me, in the interest of Science), then adjust recipes as needed, and see what happens when I bake each recipe a third time. Technically, yes, I’m only baking two different bread recipes this week. But they should end up very differently, as I’ll be baking them in very different circumstances. It counts! I know I’m a massive food-geek, but this is actually quite exciting and intriguing for me. I hope you’ll find it interesting and informative as well! 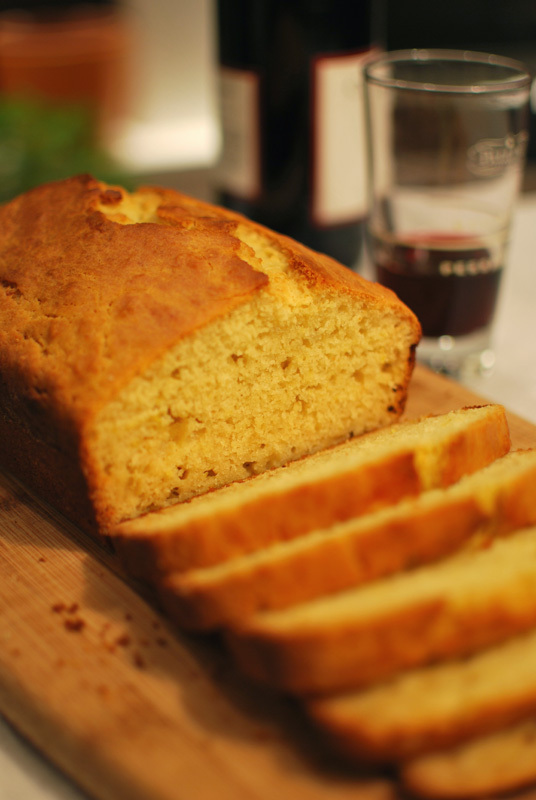 The first bread I’ll be making this week is a savory quick bread, one redolent with olive oil and a touch of lemon. It’s very simple, and doesn’t call for any more exotic ingredients than the aforementioned; something important when baking in a strange kitchen where one has no idea where the grocery stores even are, let alone where to find the good epicurean stuff. I’ve adjusted the original source recipe, which called for sugar, to use honey instead. I love the combination of olive oil and honey; it’s one that I think is often not even considered, but is very tasty nonetheless. The end result is a mild-flavored bread, one that can be enjoyed toasted with jam or honey for breakfast, as well as served plainly with certain dinner entrées (anything you might eat a biscuit with). The flavor is simple, tasty, and lends itself to endless variations if you so choose. Add some herbs or spices for a more savory version (it almost begs for black pepper! ), or add dried fruit for a sweeter option (currants or golden raisins would be ideal). The texture is close-crumbed, easy to slice, and has a tender bite throughout. I do recommend you use a quality olive oil here – not your finest and greenest extra-virgin, but certainly not the cheapest sludge on the shelf either – as the flavor really shines in this application. It’s not a very exciting bread, but it is charmingly straightforward, and lends itself well to any number of flavor additions, either added to the batter, or spread on top of a slice. This version, the one from my own kitchen, was one that I would keep in my permanent recipe file; but perhaps I would never make it as plain again. There’s just too much room for delicious variation! I’m excited to see what the high-altitude version will end up like; how different could it possibly be? 1. Preheat oven to 350° F. Lightly butter a 9 x 5 inch loaf pan, sprinkle with flour, and turn upside down and knock on the bottom to remove excess. In a medium bowl, whisk together the flour, baking powder, salt, and lemon zest; set aside. 2. In a large mixing bowl, whisk together the honey, eggs, milk, and olive oil. Add the flour mixture, stirring until just combined, being careful not to overmix. 3. Transfer the batter into the prepared loaf pan, and smooth the top. Bake at 350° F for 50 to 60 minutes, or until a skewer inserted in the center comes out clean. Allow to cool in the pan for about 5 minutes before removing to a wire rack to cool fully before slicing. Serve slightly warm or reheated. 1. This bread will keep, wrapped in plastic, at room temperature for 1 to 2 days; alternatively, it can be frozen beautifully.